You’ll find this gem hidden in the woods of Montjuïc. There’s a reason it’s a secret spot – located behind the castle, it’s slightly tricky to find. Having trekked up the hill (or perhaps taken the bus half way up), you’ll arrive hot and thirsty, but glad you made the effort. With candlelit tables, paper lanterns hanging from the pine trees and very affordable drinks, there’s a reason it’s a hit with the locals. Check out their summer programme on their website – Wednesdays is sardines and rumba, other nights feature flamenco and funk. Most days it’s a basic BBQ menu (grilled chicken, butifarra) served with salad and corn on the cob. Located on the 11th floor of this Raval hotel, the aptly named 360º Bar is a stunning terrace with panoramic views of the city. It’s a magical place to come and have a drink as you watch the sun go down. There are fixed binoculars on the roof for checking out the city and a small plunge pool. From the hotel lobby, head to the far lift which goes directly to the bar (the other two lifts bring you to the 10th floor). There’s a good bar list and tasty snacks to tide you over. Summer nights feature DJs spinning tunes most Thursday-Saturday evenings. 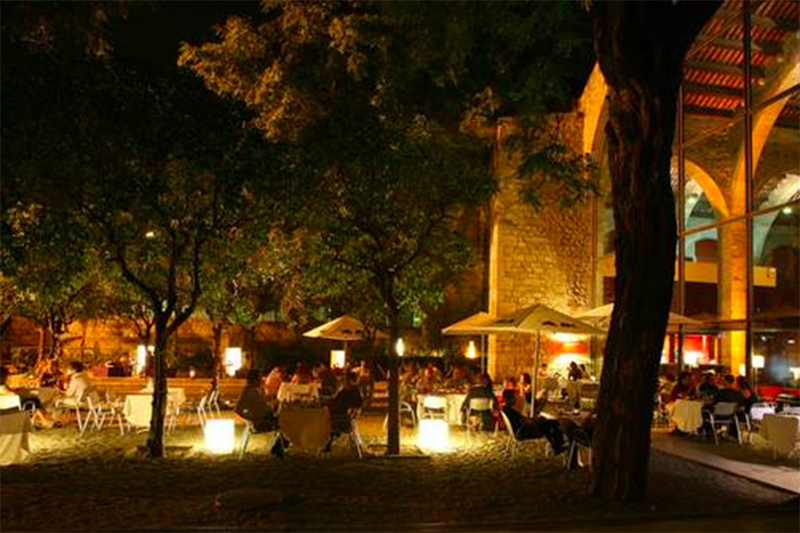 Only a stone’s throw away from Plaça Catalunya, this urban garden is a lovely place to have a drink on a balmy night. The Pulitzer Rooftop is synonymous with great music with DJs and live acoustic performers mix things up on summer nights. In winter, the terrace is open on weekends from October to April with its DJ aperitif sessions. Whilst the Pulitzer hasn’t got the stellar views of some of Barcelona’s other alfresco bars, the vibe more than makes up with it. There’s also a nice menu of tapas – patatas bravas, croquettes, marinated anchovies in oil, giant olives, Mahón D.O. cheese, Iberian ham with bread and tomato. 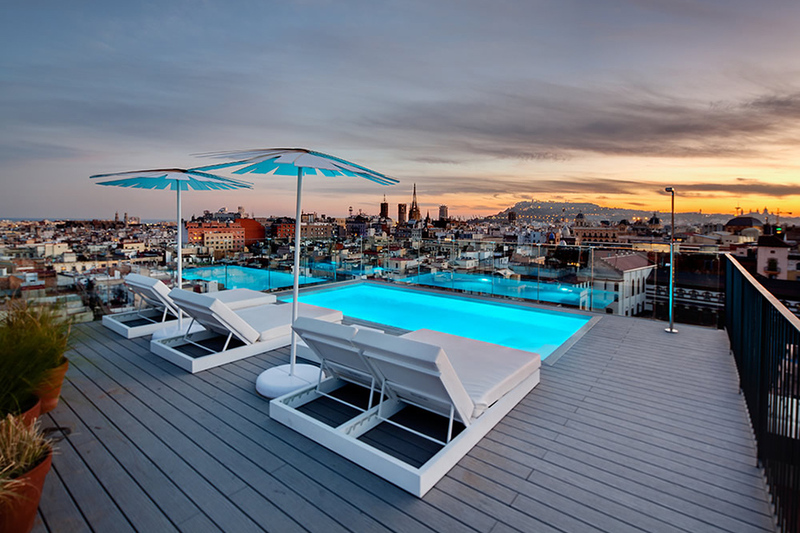 Few things come close to sipping a cocktail poolside whilst admiring the spectacular views of Gaudi’s La Pedrera, Sagrada Familia and the lights of Montjuïc. Located in Eixample on the corner of Carrer of Rosselló and Diagonal, the Hotel Omm is one of the best alfresco bars in Barcelona. Entry is exclusive to guests during the day and opens to the public after 7pm. 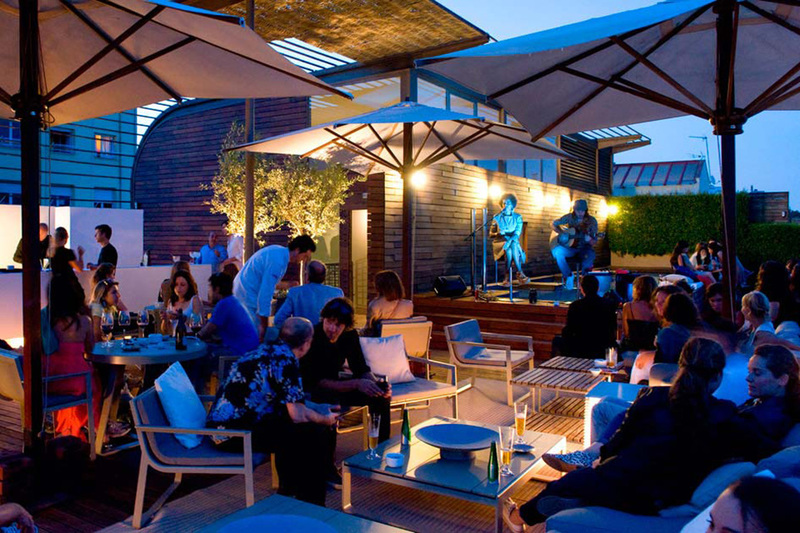 During summer, the rooftop terrace has live music from Thursdays to Sundays. It has a pool and an area with sofas and hammocks in which to relax. You’ll find great cocktails here, along with tapas and a sushi bar. There’s nothing fancy about this place – cheap drinks and no table service, but it’s one of the best places to hang out on a sunny afternoon in the Ciutat Vella district, in the heart of Barcelona. Located between the Palau de la Musica and Santa Caterina market, the large outdoor terrace is hidden from sight and is accessed via a small staircase from a quiet side-street. The cheap drinks, relaxing open terrace and free wi-fi make it popular with locals and ex-pats alike. It tends to get pretty crowded on sunny days, so try aiming for early evening or mid-Sunday afternoons. 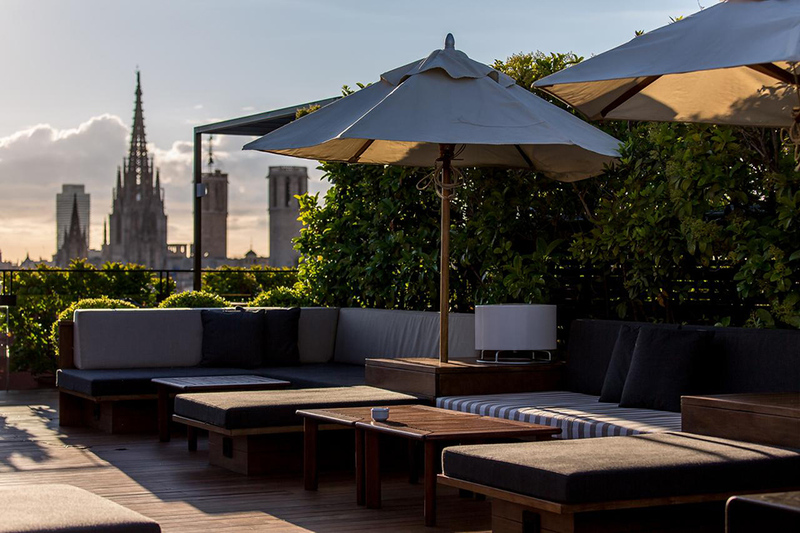 Timelessly elegant, this beautiful rooftop bar is a hidden gem amidst the bustle of Barcelona’s busy La Ramblas. Named for one of the most beautiful islands of the Philippines, La Isabela, this terrace has a pool, comfy lounges and panoramic views of the city. There is an impressive range of cocktails and bar snacks include crispy prawns with tamarind, Catalan rice with prawns and cockles and burrata salad with tomato compote. During summer, La Isabela often hosts special cocktail nights, live music and other events. Check out their website for more details. 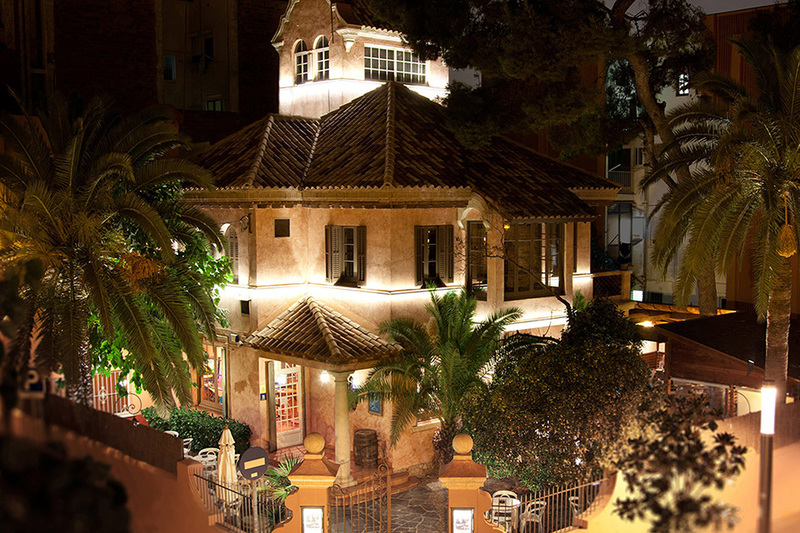 The sprawling terrace of Torre Rosa is located in a grand old style Barcelona house and is an incomparable place to have a drink under the stars. The gorgeous building has a rich history dating from the early twentieth century when it was owned by a Catalan family who made their fortune by trading rum with Cuba. Staff are friendly and are on hand to offer you an encyclopaedic knowledge of their gins, vermouths and other drinks. Located in Sant Andreu, Torre Rosa is slightly out of the city centre (20 minutes in a cab), but it is well worth the (slight) hike. An evening sipping a cocktail under the stars here will transport you to Havana. 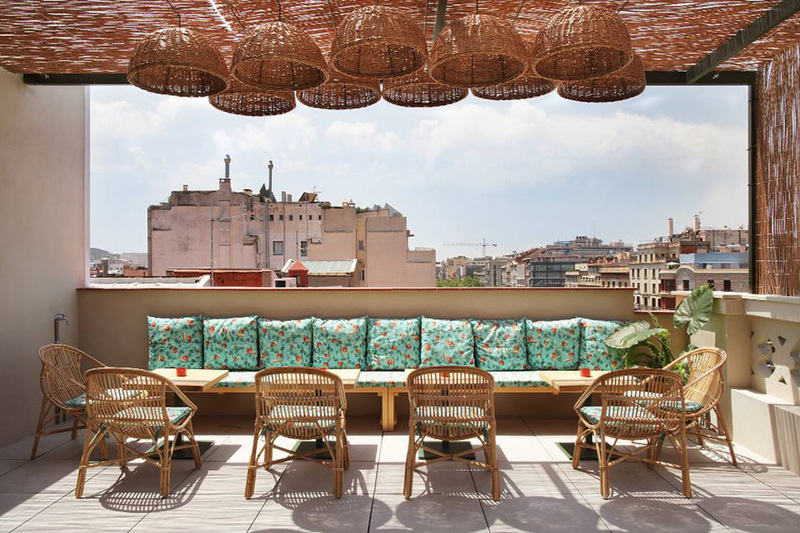 Situated in an immaculately preserved 19th-century building in Barcelona’s leafy Eixample district, the rooftop of Casa Bonay has two terraces with superb views of the city. There is a bar exclusive for clients which features sun beds, a shower for cooling off and an orchard. The terrace open to the public is El Chiringuito de Bonay, which has taken the “Beach shack” concept and given it an elegant twist. Cane furniture, wooden light fixtures and ocean-inspired furnishings lend a chilled vibe. 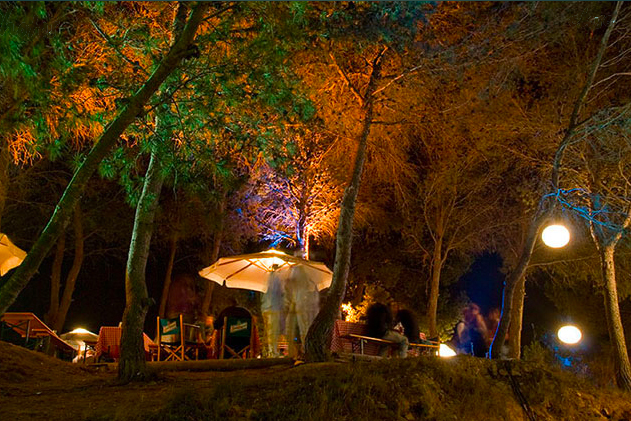 During the summer there are daily yoga classes and asaditos (barbecues) as well as tapas and an extensive wine, beer and cocktail list. 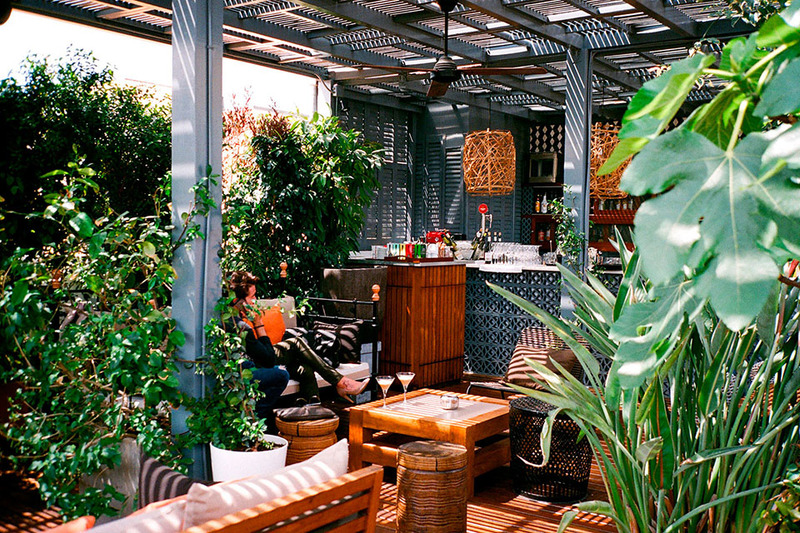 With its 360º panorama, this is one of the best alfresco bars in Barcelona. 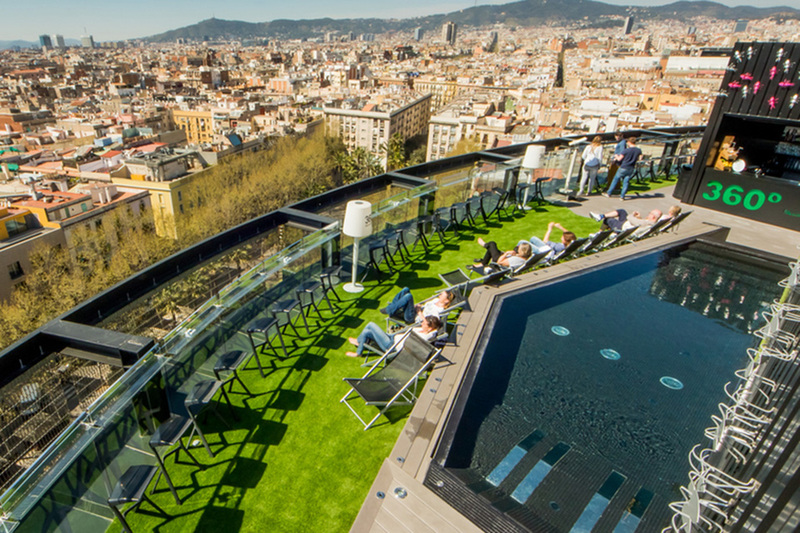 The Yurrban Trafalgar Hotel’s Rooftop is located close to Placa Urquinaona and a short walk from El Born and the Bari Gotico making it a great place to have an apertivo before dinner. What the terraces lacks in space it makes up with killer views of the city. There is a chill-out zone to enjoy cocktails, or you can swim in the rooftop pool and relax in the lounge chairs. On weekends, DJs and live music gets the party started. 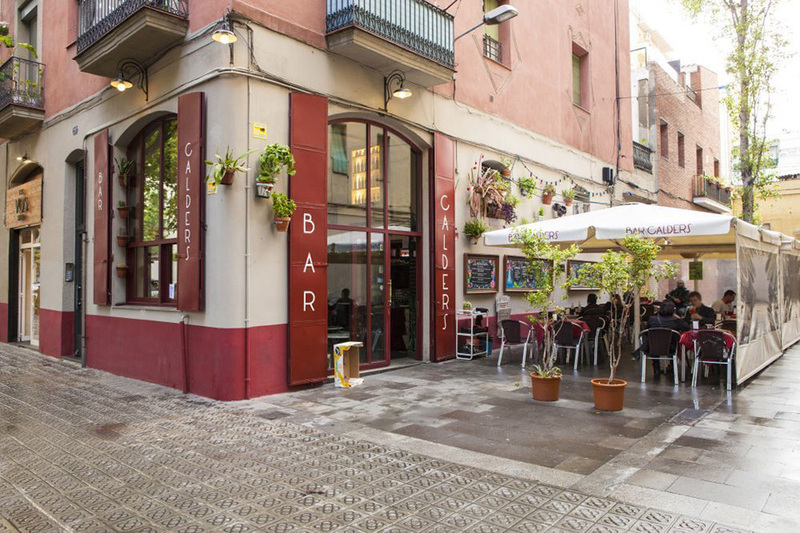 Bar Calders is in Sant Antoni, which is fast becoming one of the coolest areas in Barcelona. A charming and super friendly atmosphere together with good food at decent prices have made Bar Calders a popular spot. The menu is Mediterranean with a Mexican influence – try the green chicken enchiladas with beans and Mexican cheese au gratin. They have a great selection of vermouths, wines and beers. Although it can be tricky to get a table on the patio, it’s worth the wait for the atmosphere which can include spontaneous live street performances and live music. With its pretty terrace overlooking the square, Bar Kasparo is a perfect place to escape the hustle and bustle of La Ramblas. 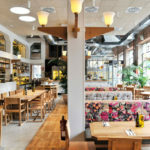 Kasparo serves simple tapas, sandwiches (bocadillos) and salads. The children’s playground in front of the bar is the perfect place to let the kids run around while sipping something from the healthy collection of herbal teas, great coffee, wine and beer. 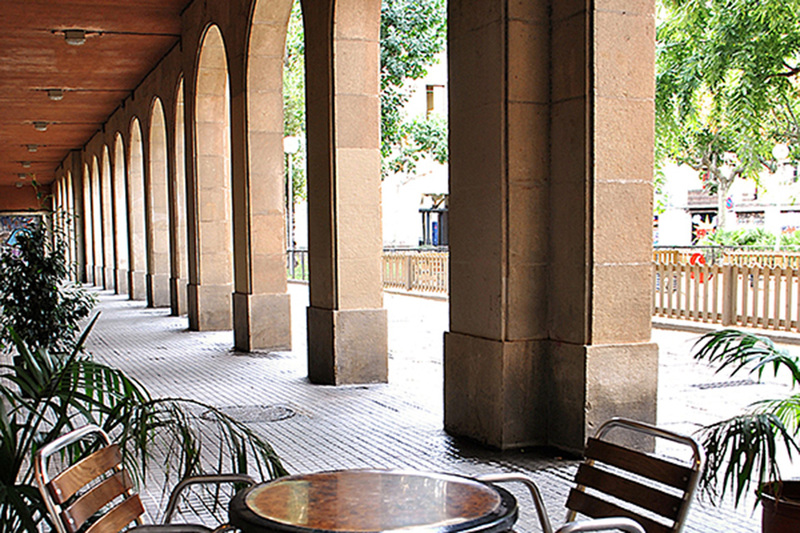 Located in the grounds of the 15th Century Santa Creu Hospital this gorgeous leafy courtyard is a magical place to relax in the heart of Raval. Little tables and chairs are set up amongst the cloisters and gardens of the terrace. The grounds are now home to the Biblioteca de Catalunya (Library of Catalunya) and the cafe sits looking on to a bigger courtyard dotted with orange trees, street performers and old men playing giant chess. Try the smoked salmon salad with avocado, mango and soy and wasabi vinaigrette; the beef carpaccio with arugula, parmesan and mustard vinaigrette or the wide variety of tapas on offer. Located in Drassanes (at the bottom of La Ramblas), Museo Marítimo de Barcelona (Maritime Museum of Barcelona) celebrates the history of shipbuilding from the thirteenth to the eighteenth century. The beautiful cafe, Proyecto Norai at the Museo Marítimo has a beautiful light-filled interior, while the outdoor cafe is something of an urban oasis. Sitting amongst the orange trees whilst sampling the cafe’s delicious seafood or tapas is a must. What’s even better is that Norai, hires its staff from the nearby Raval neighbourhood and is the type of initiative that would make Jamie Oliver proud.